Macrophage is any of the specialized class of large, phagocytic cells within the tissues, including blood, that originate from specific white blood cells called monocytes and that destroy foreign bacteria and other microorganisms as well as cellular debris, and senescent and damaged cells. They are one of two main cells that defend the body against infection by ingesting invading microorganisms, the other being neutrophils (Alberts et al. 1989, 334). Macrophages act in both the nonspecific defense (or innate immunity) as well as specific defense (or cell-mediated immunity) of vertebrate animals. Their role is to phagocytose (engulf and then digest) cellular debris and pathogens either as stationary or mobile cells, and to stimulate lymphocytes (another type of white blood cell) and other immune cells to respond to the pathogen. The immune system involving the actions of macrophages is amazingly complex and harmoniously coordinated, recognizing and removing invading particles and coordinating with the T-cells to provide the necessary protection of the body. Should the macrophages attack healthy body cells, it would be disastrous. Yet, this complex system can discriminate between the body's own cells ("self" antigen—those of the original organism), and those that are foreign ("non-self"). Macrophages may digest more than 100 bacteria before they finally die due to their own digestive actions. Macrophage comes from the Greek for "big eaters," from makros "large" + phagein "eat"). The immune system is often divided into two sections. The first is innate immunity, which is comprised of hereditary (always there) components that provide an immediate "first-line" of defense to continuously ward off pathogens. The second is adaptive (acquired) immunity that works by manufacturing a class of proteins called antibodies (humoral immune system), and by producing T-cells specifically designed to target particular pathogens (cell-mediated immune system). This response takes days to develop, and so is not effective at preventing an initial invasion, but it will normally prevent any subsequent infection, and also aids in clearing up longer-lasting infections. In the innate immune system, macrophages are the second-line of defense, after the physical (skin, mucous coating of the gut) and chemical barriers (anti-microbial molecules like lysozymes) provide the first line of defense. In the second line of defense, after foreign substances gain access to the body, phagocytic cells (macrophages and neutrophil granulocytes) can engulf (phagocytose) foreign substances. Macrophages are thought to mature continuously from circulating monocytes. Phagocytosis involves chemotaxis, where phagocytic cells are attracted to microorganisms by means of chemotactic chemicals such as microbial products, complement, damaged cells, antibodies, and white blood cell fragments. 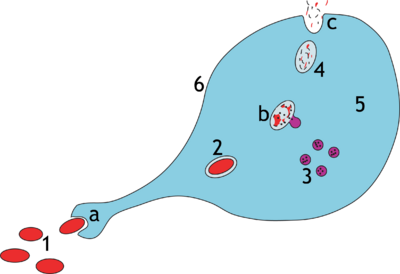 Chemotaxis is followed by adhesion, where the phagocyte sticks to the microorganism. Adhesion is enhanced by opsonization, where proteins like opsonins are coated on the surface of the bacterium. This is followed by ingestion, in which the phagocyte extends projections, forming pseudopods that engulf the foreign organism. Finally, the bacterium is digested by the enzymes in the lysosome, exposing it to reactive oxygen species and proteases. The cell-mediated immune system, the second main mechanism of the adaptive immune system, destroys virus-infected cells (among other duties) with T cells, also called "T lymphocytes." Cell-mediated immunity is an immune response that does not involve antibodies but rather involves the activation of macrophages and natural killer cells, the production of antigen-specific cytotoxic T-lymphocytes, and the release of various cytokines in response to an antigen. Macrophages are a type of leukocyte or white blood cell, which include several types of blood cells that have a nucleus and cytoplasm and are part of the immune system. The three main categories of leukocytes are granulocytes (neutrophils, basophils, eosinophils), lymphocytes (B cells, T cells, natural killer cells), and monocytes (including macrophages). These carry out a wide variety of protective functions, including producing antibodies, engulfing bacteria and protozoa, ingesting dead and infected cells and debris, and so forth. However, all of these types are produced and derived from a pluripotent cell—a cell that has the potential to differentiate into a variety of cells—in the bone marrow known as a hematopoietic stem cell. Monocytes share the "vacuum cleaner" (phagocytosis) function of neutrophils, but are much longer lived as they have an additional role: they present pieces of pathogens to T cells so that the pathogens may be recognized again and killed, or so that an antibody response may be mounted. Monocytes are able to develop into the phagocytosing macrophage cell after they migrate from the bloodstream into the tissue and undergo differentiation. Alberts et al. (1989, 33) call macrophages "professional phagocytic cells." Macrophages not only ingest invading microorganisms, but have an important role in scavenging senescent and damaged cells and cellular debris (Alberts et al. 1989, 334). Indeed, each day, macrophages in the human body phagocytose more than 1011 red blood cells (Alberts et al. 1989). Unlike short-lived neutrophils—the phagocytes arriving at the infection after 72 hours from the time it occurred—the life span of a macrophage ranges from months to years. 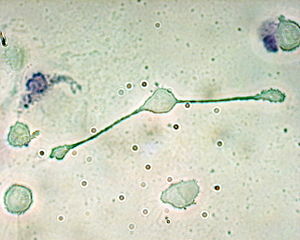 One important main role of macrophage is the removal of necrotic debris and dust in the lungs. Removing dead cell material is important in chronic inflammation as the early stages of inflammation are dominated by neutrophil granulocytes, which are ingested by macrophages if they come of age. Macrophages are versatile cells that play many roles. As scavengers, they rid the body of worn-out cells and other debris. They are foremost among the cells that "present" antigen: a crucial role in initiating an immune response. As secretory cells, monocytes and macrophages are vital to the regulation of immune responses and the development of inflammation; they churn out an amazing array of powerful chemical substances (monokines) including enzymes, complement proteins, and regulatory factors such as interleukin-1. At the same time, they carry receptors for lymphokines that allow them to be "activated" into single-minded pursuit of microbes and tumor cells. Eventually, the antigen presentation results in the production of antibodies that attach to the antigens of pathogens, making them easier for macrophages to adhere to with their cell membrane and phagocytose. In some cases, pathogens are very resistant to adhesion by the macrophages. Coating an antigen with antibodies could be compared to coating something with Velcro to make it stick to fuzzy surfaces. Macrophages provide yet another line of defense against tumor cells and body cells infected with fungus or parasites. Once a T cell has recognized its particular antigen on the surface of an aberrant cell, the T cell becomes an activated effector cell, releasing chemical mediators known as lymphokines that stimulate macrophages into a more aggressive form. These activated or angry macrophages, can then engulf and digest affected cells much more readily (NS 1988). The angry macrophage does not generate a response specific for an antigen, but attacks the cells present in the local area in which it was activated (NS 1988). Investigations concerning Kupffer cells are hampered because in humans Kupffer cells are only accessible for immunohistochemical analysis from biopsies or autopsies. They are difficult to isolage from rats and mice, and after purification only approximately 5 million cells can be obtained from one mouse. Macrophages can express paracrine functions within organs that are specific to the function of that organ. In the testis, for example, macrophages have been shown to be able to interact with Leydig cells by secreting 25-hydroxycholesterol, an oxysterol that can be converted to testosterone by neighboring Leydig cells. Also, testicular macrophages may participate in creating an immune privileged environment in the testis, and in mediating infertility during inflammation of the testis. When fighting influenza, macrophages are dispatched to the throat. However, until the killer T cells for the flu virus are found, the macrophages do more damage than help. They not only destroy throat cells infected with the flu virus, but also destroy several surrounding non-infected cells. Macrophages are believed to help cancer cell proliferate as well. They are attracted to oxygen-starved (hypoxia) tumor cells and promote chronic inflammation. Inflammatory compounds such as Tumor necrosis factor (TNF) released by the macrophage activates the gene switch nuclear factor-kappa B. NF-kB then enters the nucleus of a tumor cell and turns on production of proteins that stop apoptosis and promote cell proliferation and inflammation (Stix 2007). New Scientist (NS). 1988. The human immune system: The lymphocyte story. New Scientist March 24, 1988. Retrieved October 15, 2007. Stix, G. 2007. A malignant flame. Scientific American July 2007: 46-49.